We'd never hoped to see one, frankly. But life takes odd turns. And there ahead of us in the grass was just what we'd never hoped to see. A purple cow. You might expect to see a purple cow after a morning spent in the company of bottomless mimosas, which are standard brunch fare around here these days. Broad daylight being a requirement, a night of carousing provides a less than an ideal opportunity. But we never order bottomless mimosas, preferring a glass of prosecco with our Sunday brunch. This has no effect on our eyesight or the visions inspired thereof. So we can state with no exaggeration that this was indeed a purple cow, the red and blue of its hide mingling nicely among our rods and cones to produce a genuine purple. And that would be the end of it if we hadn't jumped up in bed during the night suddenly and painfully aware that there could be an entire generation, several even, who may not have heard of Gelett Burgess. We did the only honorable thing under the circumstances. We shot the thing. We take the neglect of local (San Francisco, that is) writers seriously. Burgess was born in Boston and graduated from MIT but soon came to his senses and moved to San Francisco. In 1887. He'd gotten a job with the Southern Pacific Railroad. He was a draftsman. Which, in our confusing language, is not the human equivalent of a draft horse. He did pull things, though. A prank. That cost him his job teaching drawing at the University of California. The whole thing so destroyed his happy life in San Francisco that he was obliged to remove himself to New York City. But English being spoken there in some variant, he felt obliged to go even further, on to France, in fact, where his native tongue was taken about as seriously as a purple cow. 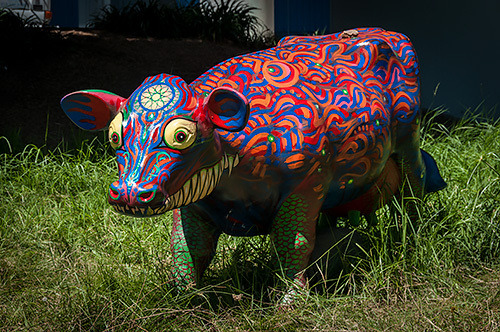 And that was the end of it, really, until some unnamed artist with too much red and blue paint managed to coral a commission to paint this cow that lives under the freeway in a patch of unchewed grass (cud, being the technical term). With a Nikon D300 (no, we're not tempted by the D550 for some green reason) and an 18-200mm Nikkor without a polarizer on it this time (when we really needed it for those shiny highlights). We processed the DNG we converted from the NEF in Camera Raw, adding a slight vignette to spotlight the cow. I knew I had to shoot it. I used a dSLR to do it.